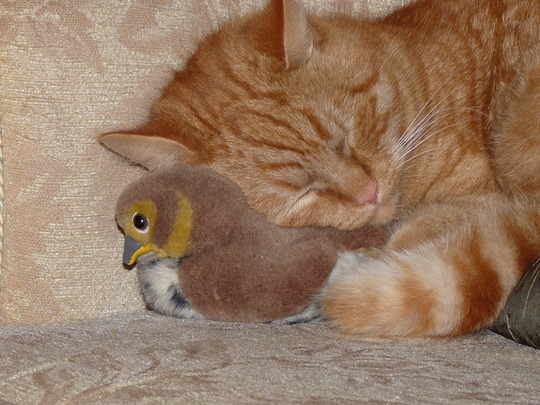 He likes to snuggle up to this Amy as it belongs to Jasper the canary, it has one of those bird sounds you know when you press it. Jasper always grasses on Ted if he is looking at her, so this is the next best thing...Lol! Beautiful photo Janey...had to put it on our favourites too ! When I saw the 'thumbnail' of this on my homepage I thought it was a real chick!! I thought it was an actual miracle! lol! Lol Karen...not with the size of his paws! Aww He's as cute as ever Janey-and doesn't he know it ! lol. I think he would prefer the butter to be spread on a nice fat Blackbird Karen...last year he grabbed one and brought it through the cat-flap, luckily I got it from him and off it flew! Pets look so cute with their toys ! Think everyone as said it all Teddy is so lovely and sweet. Brill photo. He is just so sweet. That's a lovely pic. of Teddy, Janey.